Much of the former Yugoslavia (Serbia, Bosnia and Croatia) is under water and hundreds of thousands of buildings are inundated across the region. Some of the worst flooding ever experienced in the area has killed almost 50 people and triggered more than three thousand landslides. Hundreds of thousands of people have been evacuated and millions of people are affected. People all across the region are cut off with no water, food, power or communications. The floods are exposing some of the more than one hundred thousand mines and driving the biggest mass migration in the Balkans since the war in the 1990s. Four months of rain fell in less than 40 hours in some areas causing rivers to jump their banks. The cause of this inundation started with a powerful heat dome high pressure system over a region just north of the Caspian Sea. By late Tuesday one week ago, a powerful low pressure system had formed, bringing precipitation and turning the system into a kind of inland hurricane. In addition to destroying homes, washing out roads, bridges and railway lines, the flooding has severely damaged the coal-fired Nikola Tesla power plant which supplies electricity for half of Serbia and most of Belgrade. "What we are facing is the biggest water catastrophe in Serbia’s history," Serbian Prime Minister Aleksandar Vucic said. "These are the kind of waters not seen in 1,000 years, let alone 100." As the climate continues to warm more flooding is expected from increased precipitation and melting ice. Although it is still too early to make a causal connection between global warming and the flooding in the Balkans, a link has been drawn between recent unprecedented flooding in the UK and climate change. 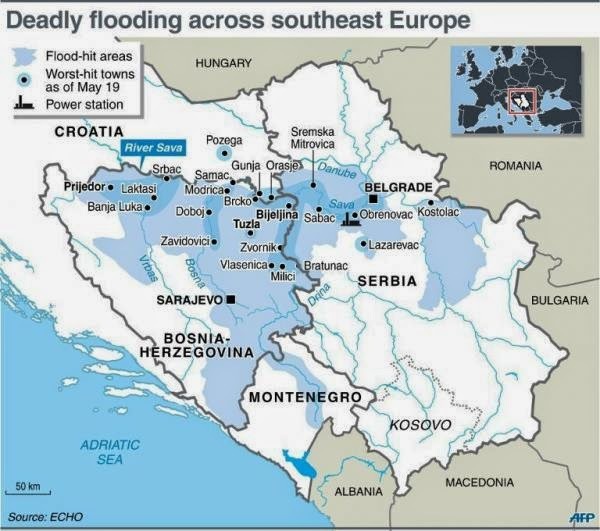 The cost of the flooding in the Balkans is already hundreds of millions of dollars. However, the costs of the damage associated with flooding is only one facet of the situation, landslides are another corollary of climate change. In addition to flooding and landslides, climate change also leads to mass migrations which can trigger its own set of problems including conflict. Flooding has proven to be very expensive and the situation is expected to get far worse. One report indicates that flooding will double in the EU by 2050. The EU is already spending billions to deal with flooding ($6.7 billion between 2000-2012) and it is expected that this number will rise to $32.1 billion by 2050. Globally, the costs from flooding alone are estimated to be at least 2 trillion annually and the IEA says that climate change will cost $115 trillion by 2050. Infographic - How Much Would it Cost to Go Green Globally?